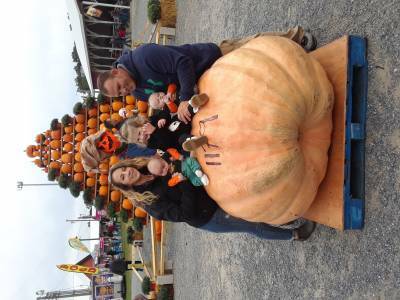 South Jersey Pumpkin Show celebrates the fall harvest of Pumpkins & more! 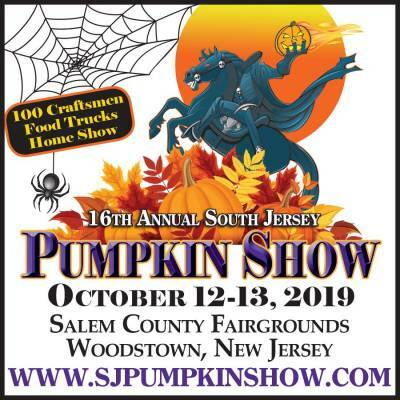 Salem County Fairgrounds, New Jersey; The 16th annual South Jersey Pumpkin Show will open on Saturday, October 12th & Sunday, October 13, 2019. This two-day “Festival of Pumpkins” will be held at the Salem County Fairgrounds, 735 Harding Highway, Woodstown, New Jersey. The event has new show hours of Saturday 10am to 8pm and Sunday, 10am to 6pm. 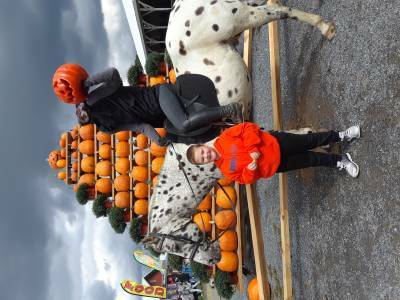 The South Jersey Pumpkin Show has become one of the best ways to welcome the autumn harvest with kids and parents alike. Festival goers visiting will enjoy pumpkin desserts, 100+ craftsmen, Salem County Fall Home Show, fun contests, give-a-ways, wine sampling, giant food court, NJ Largest Baked Pumpkin Pie, pony rides and hayrides around the fairgrounds. The festival will host a variety of live musical acts daily. The giant Pumpkin Pyramid, filled with pumpkins, gourds and mums, represents everything beautiful about the fall harvest. Each year many of our vendors create hand-crafted scarecrows and festival goers are invited to judge our entries. The “Fall Festival of Trees Exhibit” is a must see when visiting the festival. Colorful trees will be decorated in Halloween, Thanksgiving and Autumn themes. Contest is open to adults, clubs and groups. There will be a pumpkin patch for kids, corn maze and pumpkin painting for the whole family. Saturday activities includes the Decorated Wagons & Stroller Contest and the Adults Pumpkin Toss with over $500 in prize money awarded. The best pumpkin desserts are being sought for the Fun Pumpkin Food contest and free sampling. Saturday will showcase the reading of the Sleepy Hollow legend and the arrival of the Headless Horsemen. The Family Halloween Costume Contest & Trick or Treat Stroll begins at 6pm. Sunday features NJ Giant Pumpkin Weigh Off at 11am, All-Breed Fun Dog Show, Little Miss & Mister Pumpkin Show King & Queen Pageant, and wine sampling all day. Come search for one of our Halloween Painted Rocks and win amazing prizes The Salem County Fairgrounds is located just a few miles from Delaware Memorial Bridge. Admissions is free, parking $5.00 a carload. Free shopping bags, free trick or treat bags, free pumpkins/gourds first 200 kids daily. Vendors and Sponsors, food concessions, craftsmen, artists and farm markets are being sought for 2019. Visit http://www.sjpumpkinshow.com for details. Call 856-765-0118. Portion of proceeds being donated to a non-profit organization chosen by B & K Enterprise.